As we ponder who the final line up of villains in the Dark Knight sequel (Batman 3) will be, here’s a picture gallery of the options, with a short explanation of who they are. Leave the combination you think they’ll pick in the comments, and we’ll give a prize to one reader who gets it right when the movie is released. Update June 2011: We now know it’ll be Bane and Catwoman with a touch of Ra’s al Ghul, but who else is going to make a cameo? The winner will be the one who gets closest on all fronts, with an obvious advantage to anyone who guessed Bane and Catwoman before they were announced (if anyone did…). Which villains would you like them to choose for the Dark Knight sequel? Obsessive compulsive who feels compelled to leave riddles forewarning of his future crimes. Also places victims in death-traps, with puzzles their only form of escape. Um, The Joker and Harley Quinn. Also I don’t think Two face is dead, just Dent. Hmmmmm Just cause Heath died why does the Joker have to die too?? He played the joker not the other way around. The Joker is a charchter and I would love to see him in the other movies such crazy people damn….. The Joker and Harley quinn meant in the asylum btw…. to the person who wrote this… Joker isnt in jail hes in the asylum… Harley Quinn was a psychardis …..
Well, it’s sort of like The Crow deal – after Brandon Lee died, the movie series was NEVER the same, never as good (at least in my opinion). I dislike it when people swap out actors for characters (they did the same thing in Iron Man 2) in general. I love the Joker, he’s my favorite villain, but Heath MADE that movie and there are some pretty huge shoes to fill there. I heard they were considering Daniel-Day Lewis for the role of the Joker, and he plays an excellent villain…but can he capture blind insanity as well as Ledger did? We’ll have to see. He was pretty crazy in There Will Be Blood after all. I think they might recast the Joker. They recast Rachel after all. Yes, Well No Matter What They Will Have To Bring The Joker Back. If You Noticed That Mostly Every Villan Seems To Know Who The Joker Is And Haved Worked With Him Or For Him. And Harley Can’t Come Until Joker Reappears. You Can Start With Someone Intresting Like Catwomen Or The Riddler But Will Have To Mention Joker And Or Work With Him To Bring The Bat Down. Just Saying…….. There is still one thing tho. The Joker is Batman’s nemesis, and has to live on. Even if only a cameo, he still needs to live, and be seen, because he is such a big part to the Batman story. I’d love to see Harley Quinn and Poison Ivy tho, since they, in the comics as well as TAS work together quite a bit. Why not make them a duo in crime? would be awesome. Whoa, whoa, whoa!!! The Joker is “NOT IMPORTANT”?!?!? Have you ever read any Batman comic books? The Joker is to popular out a character to stop uses in this series, just because he passed away doesn’t mean that someone else can’t play the joker just as well. He did a good job I guess at the joker, but there could alway be a better Joker and there could always be a worse one. I absolutely agree, “NO MORE JOKER!”. Heath stole the show in The Dark Knight, and to bring the character back would be an insult to no only his memory, but the audience as well. That being said, Harley would have motivation for revenge…Maybe… I just hope it one of the more believable characters. Croc, Clayface, Penguin….C’mon guys. Scare Crow had a level of realism to him, as did The Joker. Sure they are still a bit far fetch, but there is still that slight human eliment that has made the Batman franchise a stand alone franchise. He doesnt have super powers, he isnt a mutant, not from another planet, and nope…not even immortal. He’s highly trained, and the “people” he deals with are just nuts. Please keep it at least remotely believable. And personally, I enjoyed the dark element The Joker brought to the film, perhaps they will maintain it. ARE YOU INSANE? Personally If I was Heath Ledger and I died, I would want to be known for my ENTIRE body of work, not just One character. No actor wants to be typecast. Second of all, The Joker is Batman’s Nemesis, he can’t just disappear. Hell if you read the comics you would know that. Im hoping for Two face and Riddler. umm, i was thinking Harley Quinn, considering she meets and falls in love with the Joker at Arkum, and breaks him out. I think we’re gonna see The Riddler take over as main villain, with Catwoman pulling a violent “copycat” thing similar to what we saw in Dark Knight (robs banks to buy gear to get revenge on thugs by killing them). Then probably a Joker and Harley subplot thrown in. Any other filmmaker and I’d say no way they could cram it, but I believe in Christopher Nolan. they said the riddler isnt it. they also said that they didnt want to bring back the joker because of ledger.. im guessing the black mask. Riddler played by Anthony Michael Hall. Catwoman played by anyone other than Jolie. Some sort of tie up with the Joker, with a side order of Harley Quinn. Personally, I don’t think they’ll do Harley Quinn. You can’t have her without the Joker and I don’t think they’ll recast. They don’t need to, there are so many other interesting directions they could go in without awkwardly trying to bring the Joker back. Don’t be surprised if they throw the likes of The Black Mask, Hugo Strange or Hush into the mix. Batman Begins used several lesser known characters. U Know, They Will Have To Put The Joker In At Some Point, The Joker Is Like the Main Villian In Batman,……. If we watch Batman Begins again closely, there is a character in the scene where the prisoners are let out a jail that has tally marks on his arms. It is tough to catch unless purposly looking for it. But play it back, and keep an eye out for a prisoners neck. You are right about one of the criminal masterminds being the next major villian. It only make sense. Strange, Mask or Hush. I’d like to see the Penguin to make a return but most likely The Riddler will be used for the next sequal.Fingers crossed for Penguin. The penguin would be a good idea, but they have tried that once with danny devito, who could play a sinister a sinicle character and done right ? Who would play him? I can’t see any of the unrealistic (read: superpowered) villians appearing in Nolan’s Batman. And given the nature of the last film, where Batman was what Gotham needed him to be, the door is left open for a villain more evil than the Joker. Maybe The Penguin or the more gangsterly villains. Wouldn’t be surprised to see Black Mask or Hush. Personally I hope they don’t make any more Batman films. Any attempt to follow on from The Dark Knight is suicide waiting to happen. But I’d love to see Arnie return as Mr Freeze. 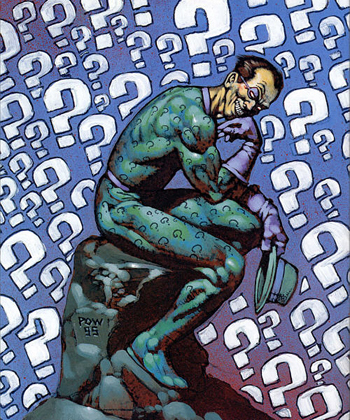 Riddler is to much like the Joker. You will not see a Nolan version of the Riddle man. Hush is a possibility though. Honestly, they have to make a thrid one because you cant end it with Batma being looked upon as a villian, Sure they could go with the Penguin or recast th joker, but the joker should wait for the 4th one because who likes to see a sequel where the villian is the same. I’d like to see Bane as a potential main villian, with maybe a side story involving Talia Al’gul. all the others seem either too dorky or too joker-like to pull off. I think they’ll use The Black Mask, or possibly Hush, either one. Then maybe The Riddler or The Penguin. Two Face I think could come back. I don’t think The Joker will come back in Batman 3. I could see Talia fitting in somewhere. Catwoman maybe, but she’s been used in so many Batman movies already. The next Batman villans will be The Mad Hatter, Harley Quinn, and Poison Ivy.